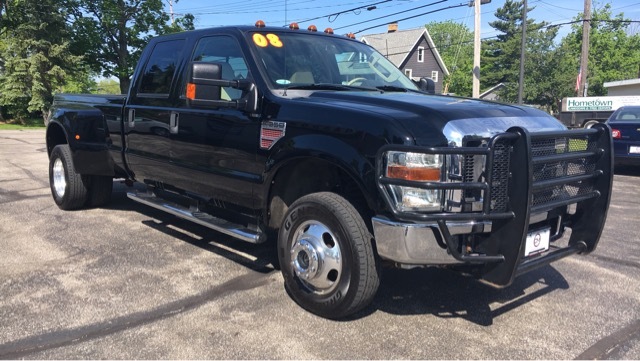 2008 Ford F-350 Crew Cab Lariat Super Duty 4x4 Offered by Chardon Motors. This is a CARFAX CERTIFIED vehicle. This truck looks like it is only three or four years old! Really, really impressive condition inside and out AND underneath. Doesn't show evidence of fifth-wheel towing or a plow either! Featuring 6.4L Diesel engine, automatic, built in trailer brake, memory driver seat, power extending mirrors, moonroof, dual climate, heated front seats, leather, power driver/passenger seats, aux input, CD, cruise, center folding console with six-passenger ability, integrated steps in tailgate, brushguard, all-weather floor mats, fog lights, and much more! This is a great buy in this price range! Powertrain warranties available too!